A graduate of the Faculty of Finances and Statistics of the Main School of Planning and Statistics (currently Warsaw School of Economics) in Warsaw. He is a chartered auditor. He started his professional career in Budimeks in 1978. Since 1990, a member of the Management Board and the director for economic and financial affairs at Budimex SA. 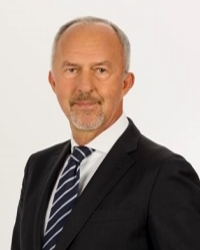 In the years 1998-2009, the general director and the president of the Management Board at Budimex SA, currently the President of the Supervisory Board. A member of the Main Board of Business Centre Club. The president of the Polish Construction Employers Association. A member of the First Warsaw Golf & Country Club. In 1978, graduated the Faculty of Economic Sciences at the Warsaw University and in 1991, the studies at the Institute of Capital Market by the United States Securities and Exchange Commission. In the years 1994 – 2004, the head of the Securities and Exchange Commission. In the years 2004-2005, the Minister of Treasury. In his professional career, he was e.g. a member of the Banking Supervision Authority and the Insurances and Retirement Funds Supervision authority. Served key functions in the International Organisation of Securities Commissions. Currently, a partner in the advisory department at PricewaterhouseCoopers and the vice-president of this company in Poland. As a golfer, represents Sobienie Królewskie Golf & Country Club. A graduate of foreign trade at the Main School of Planning and Statistics (currently Warsaw School of Economics). In the years 1986 – 1997, an advisor at the Polish Foreign Trade Council branch in Olsztyn; in the years 1992 – 2012, the director of the Olsztyn branch of the Bank Handlowy in Warsaw S.A. Citi Handlowy. Since 1994 till 2012, a member of the Management of the Business Club branch for Warmia and Mazury region. Since 1995, a member of the Mazury Golf and Country Club, president of which he was in the years 2005-2010. Currently, the owner of JHS company and a member of the Supervisory Board of the OSTOJA pension insurance company. Honored with the Silver Cross of Merit. His son Witold and grandson Jan also play golf. A graduate of the Białystok University of Technology in the field of Technology and Organization of Construction. He started his professional career in 1981 in a construction company, where he obtained construction and sanitary qualifications. Since 1984 he has been running a business – Kasol J.A. Kazberuk. On the Polish market, products are known under the „Leśne Skarby” brand. Since 2002, he has been the president of the Golfclub Golfstok Białystok. From 2013, Honorary Consul of the Republic of Malta in Poland. A graduate of the faculty of Law and Administration at the Maria Curie University in Lublin. Completed judge’s legal training at the District Court in Lublin. Currently, professionally active as a lawyer. Since 2002, an active entrepreneur. A passionate of golf, multi-year president of the First Golf Club in Lublin (currently, vice-president). One of the initiators of the construction of the first public golf course in Lublin.